> Blog > IBS > bloating > Is Eating Dairy Healthy or Not? Is Eating Dairy Healthy or Not? There’s the argument from the dairy industry and conventional medicine that if you don’t eat dairy you’re putting your bone health at risk. 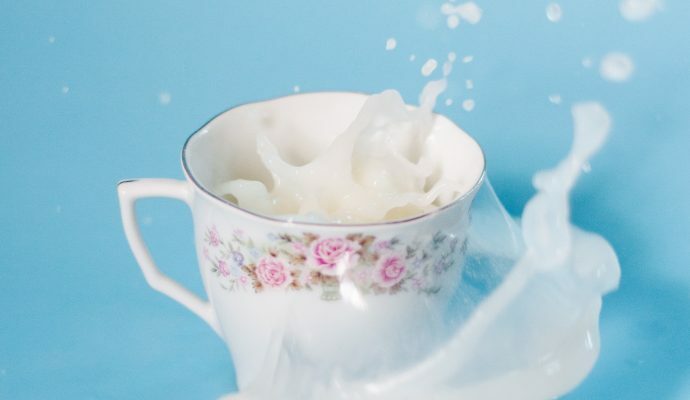 Other health professionals have long argued that consuming dairy products causes low-grade inflammation in the body, may increase the risk of cancer, drain your energy and give you spots. Vegans also argue that eating dairy isn’t natural for humans, and that dairy farming involves cruelty to animals many of us are unaware of, plus it significantly contributes to global warming. In this newsletter, I want to give you all the details on what’s good and not so good about dairy, and the positive benefits of giving up milk-based products. If you’re even considering ditching dairy, there is one really important thing you need to do. I’ll tell you about that too. Bone is not static but is constantly changing. Old bone breaks down and new bone is formed on a continuous basis. In fact, the tissue of the skeleton is replaced many times during life. When you get past 30, your process of bone breakdown is a bit speedier than new bone being made, so you need to make sure you’re getting good levels of calcium to fortify your skeletal frame. Although you can get calcium from other foods, the reason why dairy is touted as being the best source, is that the calcium from milk-based foods are more readily absorbed by the body. Skip down to the bottom of the story to find out how you can safely choose not to have dairy in your life. There are some specific foods you will need to eat. Cow’s milk also contains the omega 6 fatty acid conjugated linoleic acid (CLA). Studies suggest CLA can help with weight loss, and can reduce the risk of diabetes and cancer. CLA is also contained in grass-fed beef. The bottom line is that human beings weren’t designed to drink milk of any kind after the weaning period (around two years old). Not human milk, and certainly not milk from cows, sheep or goats. Some cultures have embraced drinking dairy products, and people in those cultures have genetically adapted to tolerate it. Others haven’t and for those people in particular, eating dairy can cause problems. Two of the biggest problems associated with dairy are digestive and skin issues. Contrary to popular misconception, growth hormones are banned in the UK and antibiotic use is limited. However, a dairy cow can be given reproductive hormones and prescribed antibiotics by a vet to ensure she is kept in a condition to produce an unnatural amount of milk. Contains oestrogen. Small amounts, true, but still oestrogen. Some cancers and medical conditions like endometriosis, PMS, fibroids and even menopause are linked to a dominance of oestrogen compared to progesterone. As well as having more naturally occurring sugar than you’d think. A cup of milk has about 3 teaspoons. Sugar, I hear you say. Where? The type of sugar in milk is called lactose. You might be tempted to say, ‘I’ll have lactose-free milk then’. Lactose-free milk has had the milk sugars broken into galactose and glucose. Same amount of sugars, different currency. However, the milk sugar is often the ingredient people do not tolerate, so a lactose-free milk can provide the benefits of regular milk without the dodgy tummy. Non-organic dairy products contain antibiotic residues, so if you are eating dairy, try to choose organic. Many studies have examined the relationship between dairy consumption and cancer. Some studies indicate that dairy may protect against cancer, while others suggest that dairy may increase cancer risk. Most of them are so-called observational studies. These types of studies use statistics to estimate the relationship between dietary intake and the risk of getting a disease. Observational studies can not prove that a food caused a disease, only that those who consumed the food were more or less likely to get the disease. And you’re more likely to get spots or have acne. There’s significant data supporting the role of dairy consumption in the development of acne, with the strongest association being skim milk. Scientists aren’t 100% sure of the reason why though it’s likely to be something to do with the hormones present in milk. Another theory is that dairy products stimulate insulin secretion and scientists have found that more insulin means more acne. My favourite non-dairy milks are almond, coconut, hemp, oat, and rice. You’ll want to choose the unsweetened varieties if there is an option. You’ll be missing out on calcium for bones, so you’ll need to find it some place else. That means letting more of these foods into your diet on a daily basis: cabbage, spring greens, bok choy, kale, broccoli, okra, almonds, tofu, and fish where you eat the bones (like tinned sardines or tinned salmon with bones). The RDA (recommended daily allowance or how much a healthy person needs to eat to not get sick) for calcium is 700mg a day. A cupful of cooked kale has 177mg. Raw (because less fits in the cup), it’s 53mg. You don’t have to. If you love pizza, try giving up dairy but having an exception for pizza. Although going completely dairy-free would be the goal, even taking most of the dairy out of your diet can still bring benefits. For most dairy products, there is an excellent dairy alternative. Some are most surprising. I wonder whether you have experienced the delicious creaminess that a handful of cashews can bring to a soup, for example? However, there are some groups of people who really should give it a miss; those who have an intolerance to dairy would do well to remove it entirely for at least three months to heal the gut. And, if you have a true allergy to dairy (IgE reaction), you will want to steer clear forever.